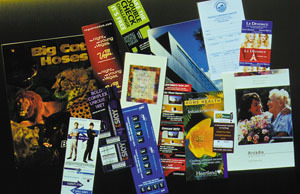 Your one-stop source for full color printing that makes an impact. you need at every step of your project. Quality printed materials at affordable prices. Call or email us when you are ready to get your product or service noticed. For short or long runs, send us your print requirements and we'll provide you with a fast, FREE estimate. With our many years of printing knowhow, let us help you choose the right stock, finishing processes and customize your fulfillment options. Call us as you begin a new project. We may be able to make a few suggestions on ways to trim costs and help you keep track of the countless details your projects require. To make sure your projects keep on track we monitor and evaluate your job at every stage. We stand behind our service. As committed to your job as you are. We want you to come back. Satisfied. • 1-9 color printing up to 25"x36"
• 2 color envelope press up to 18"x22"